Hiking in and around the curiously named Deception Pass, in the far northwest of Washington State, is one of the delights of visiting this beautiful part of the world. Especially as most of the trails are easy to complete. Separating the islands of Whidbey and Fidalgo, the narrow gorge remained hidden from the original 1792 expedition led by George Vancouver, leading him to assume that the whole area was merely a peninsula leading from the mainland. So when the pass was discovered some time later, he named it “Deception” as he felt he’d indeed been deceived by it. 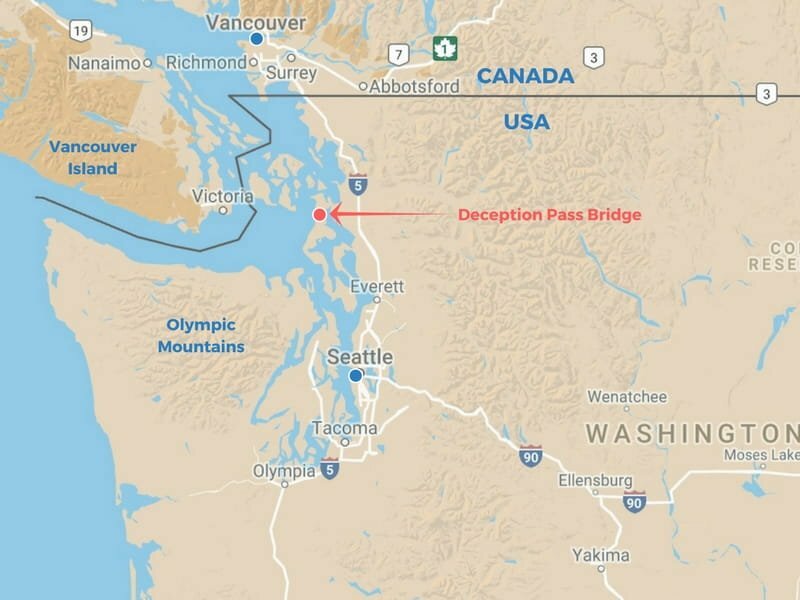 The two islands are now connected by the iconic Deception Pass Bridge, built in 1935. The surrounding area encompasses Deception Pass State Park, where you’ll find campgrounds, beaches, tidepools and stellar views in addition to the trails. Perhaps unsurprisingly, it’s now Washington State’s most-visited park. But if you’re visiting the area, it’s definitely worth exploring some of the additional trails nearby on Fidalgo Island, too. You’ll struggle to do it all in a day, but it’s a perfect way to spend a couple of days, either camping in the park or spending a night in nearby Anacortes. And, to help you plan your visit, here’s our summary of the best hikes available. It’s more of a hill than a mountain, but the walk up to the summit remains the toughest of the trails in the area. You can actually drive to the summit if you don’t have the time, but where’s the fun in that? Once you walk from the trailhead car park and into the forest it can be confusing to work out which of the various trails to take. Your best bet would be to buy a map from the nearby Mount Erie grocer. But if you’re a cheapskate like us, you might want to take a photograph of the trailhead billboard map instead. On the way up, there’s a worthwhile detour to a scenic lookout at Sugarloaf. But the real pay off is at the summit, across the car park (!) and past the communications antennae. There you’ll be rewarded with a fantastic 180-degree panoramic view of the Cascade Mountains to your left, the islands of Skagit Bay straight ahead, and the San Juan Islands to your right. From there you can walk along the rocky edge for further vantage points, and to try and escape some of the crowds that can gather during peak season. Best of all, try and time your visit for just before sunset when the whole landscape takes on a pinkish hue, reflecting off the Cascade Mountains to the east. For more detailed information on Mount Erie’s trails visit the Washington Trails Association website. If you take the route from Mount Erie to Deception Pass along Rosario Road, you’ll find three very worthwhile stops along the way at Sharpe Park, Rosario Beach and Bowman Bay. Firstly, you can take a variety of walks through the woodlands of Sharpe Park to a number of headlands with lookouts towards Puget Sound, the Olympic Mountains and the San Juan Islands. Most people head to the Sares Head Overlook but we can recommend the more challenging Porpoise Trail. Once again, it’s not particularly well marked, but as it descends down to a small headland you should keep a watchful eye towards the bay where Harbor Porpoises can often be seen feeding. Our visit followed a snowstorm, which provided some additional challenges along the exposed rocky headland! To help you prepare, here’s a map of the park. A short distance further along Rosario Drive there’s a turnoff through a pine forest down to Rosario Beach. From here it would be easy to spend a whole day exploring the trails along the water’s edge and over to Bowman’s Bay and Lighthouse Point. From the car park, it’s a short stroll to the twin beaches with their signature driftwood and pebbly sand. In between the two is the Maiden Of Deception Pass story pole carving, which is based on a legend from the Samish people who once lived in the area. From there, a short walk to Rosario Head will bring you out onto a grassy headland with fabulous views across to the Olympic Mountains. Keep an eye out below for pods of seals, porpoises and even orcas. You then have an option. Either return to the car and drive to your next stop at Bowman Bay. Or better still, continue to walk past the car park and along the cliff trail for a further half-a-mile. For more on Rosario Bay check out and print this field guide. Bowman Bay was once the site of a large Samish village but nowadays it serves as the starting point for perhaps the most rewarding of all the trails in the Deception Pass area. After following a path adjacent to the beach, the trail then splits to either Lottie Bay or Lighthouse Point. If we had to choose between the two, we’d choose the latter for its dramatic coastal scenery, views of Deception Pass Bridge and access to wildlife. Indeed, it’s worth clambering up the grassy outcrop at Lighthouse Point to not only have uninterrupted views of the impressive bridge but also to watch the pods of seals playing and feeding close by. A short walk further on towards Vista Point will bring you out over headlands that look down on more pods of seals, while American Bald Eagles soar above in between perching sessions on the surrounding trees. If it’s time for lunch, just sit down on the grass, unpack the sandwiches and take it all in. Preferably with an accompanying bottle of Washington wine. Walking across Deception Pass Bridge is probably the one activity that everyone who visits the area does at some point. And with good reason as the views, either side of it are spectacular. However, during the summer months or at weekends you definitely won’t be alone. And the traffic can be extremely heavy. So park the car, cross the bridge in both directions, take some photos – and move on! From the car park, you can access a number of trails below, which also provide you with a different perspective of the bridge. On the eastern side, one of the trails takes you through the forest and up to Goose Rock, which is the highest point on Whidbey Island. Meanwhile, on the western side, a paved footpath leads down to a long stretch of gravelly shoreline at North Beach. The beach stretches for about a mile towards a headland and the busier West Beach beyond. It can be a challenge making headway due to its mixture of large and small pebbles, which took their toll on this author’s calf muscles! Across the bay, you’ll be looking back over towards Lighthouse Point and Lottie Bay, while Deception Pass Bridge once again dominates. Other than the bridge itself, West Beach and the adjacent Cranberry Lake is the most popular area of the whole park. Largely due, in part, by its road access from Highway 20 and a huge car park running alongside the beach. On a clear day, the views across to the Olympic Mountains and the San Juan Islands are magnificent. And for sunset enthusiasts, it’s an obvious choice. Particularly with the ample supply of picnic tables and driftwood to observe it from. Hiking here is easy and is largely based on a walk along the beach and the Sand Dune Interpretive Trail through sand dunes and marshland. Behind the dunes, Cranberry Lake provides freshwater swimming and there’s a trail along its eastern shore through woodland and along the road. Finally, after crossing back over the bridge onto Fidalgo Island, there’s one more worthwhile stop before continuing the loop back towards Mount Erie. Peaceful Pass Lake is primarily a fly fisherman’s domain. But on the west side of the lake, there’s a relatively easy and quiet forest walk which meanders up and down in a loop for about three miles. And when the sun shines on the lake, with its backdrop of firs, its a riot of colour. Firstly, if you’re arriving by car you’ll need to buy a Washington State Discover Pass, currently $10 for one day or $30 for a full year. As I’ve mentioned, some of the trails are not particularly well-marked and, other than for Mount Erie, there’s a dearth of detailed maps available. However, you might find the Official Park Map useful. If you plan to combine your hiking with a night or two of camping, there are three sites available at Cranberry Lake, Bowman Bay and Quarry Pond. What did you think? Have you been to Deception Pass State Park? Or perhaps you’re thinking of visiting there in the near future? Either way, we’d love to hear from you so please add your comments below. Such beautiful photos!! I’d love to do this hike. Thank you, Lorial- hopefully, you’ll be able to try them one day!